Seven SMS students are participating in a student exchange program with Eiwa School in Shizouka, Japan. Below, some of the students share observations and reflections about homestay life in Japan. 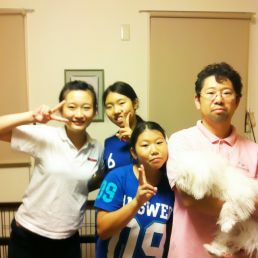 My homestay family consists of Kotomi, my host-sister, her mother, father, and dog, Duffy. Kotomi’s father is very funny, but neither he nor his wife speak English. Every day, Kotomi and I wake up at six o’clock to get ready for school. Her mother wakes up earlier to make breakfast and lunch for everyone. Kotomi’s father or mother drives us to the train station and they are always there to drive us home when we return in the afternoon. We have dinner as soon as we change out of our school uniforms and into our regular clothes. Sometimes, we go shopping after dinner. The last things we do before going to bed is homework, use the computer, and take a shower. My host family is very understanding of my western cultural tendencies and they are amazed by my willingness to learn their culture at the same time. My homestay family is a very traditional Japanese family, which means that they are very different from a Canadian family. There are so many routines and little family traditions that I have started getting used to. For example, every morning when we get up everyone goes downstairs and prays before we eat breakfast which usually consists of fish and rice. Then, when it is time to leave for school, the grandparents walk us outside and wave goodbye to us until we are out of sight. It is the sweetest thing. My home stay family even Googled famous Canadian foods to buy me, to make me feel more at home, which I thought was very nice and generous. There are 6 people living in the house, plus me. A grandma, a grandpa, an uncle, a mother and the two daughters. At first I thought I would get homesick and they would have strict Japanese rules but they are actually very relaxed. I already feel like they are my second family. They speak such good English and Nene and I have so much in common! We both love Justin Beiber, One Direction, shopping, and pink! Speaking of which, that’s the color of the toilet paper here in Japan! I think I want to live in Japan.